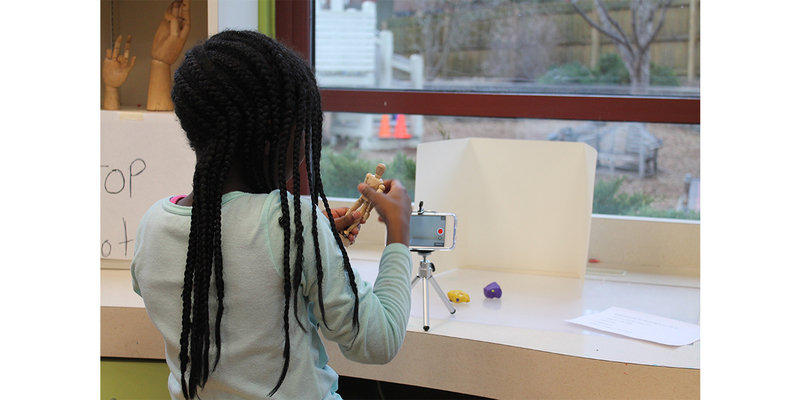 Second grade students at Maplewood Richmond Heights Early Childhood Center learned stop motion animation as a tool for self-portraiture through the Bodies in Motion project, funded by a grant from A&E's Maritz Arts and Education Fund for Teachers. The Arts and Education Council (A&E) and Maritz have awarded 15 area schools with grants to support classroom-based art projects during the 2018-19 academic year. The program, administered by A&E, is funded by a $25,000 gift from Maritz with additional support provided by individual donors. With these 15 grants, this unique partnership between A&E and Maritz has generated nearly a quarter of a million dollars for art education across the bi-state region since 2009. “A&E is proud to support teachers across our region who are using the arts to transform their students’ lives. We are grateful to have a partner like Maritz who also recognizes the power of the arts to improve learning of core curriculum and build 21st century skills like creativity, collaboration and critical thinking,” said Cynthia A. Prost, A&E president and CEO. The Ackerman School (Florissant, Mo. ), part of the Special School District, will produce four events, including a black history play and a talent show, to showcase student abilities and allow students to experience the joys of performance, music and art. Bayless Elementary School (St. Louis, Mo.) will develop a printmaking studio for its students, offering them a host of new possibilities, both within the printmaking studio, and its integration with other artistic studios. Central Visual & Performing Arts High School (St. Louis, Mo.) will purchase a projection mapping system that art students of any discipline will use to enrich their craft and exponentially expand their horizons of artistic expression. Collinsville High School (Collinsville, Ill.) will bring members of Opera Theatre of Saint Louis (an A&E grantee) to the school to perform and lead hands-on workshops in professional blocking, acting and make-up to students that prepare students for their own operatic production. Fairview Elementary (Jennings, Mo.) students will take monthly trips to the Saint Louis Art Museum to draw and study art, concentrating on African-American artists. Hazelwood West High School (Hazelwood, Mo.) will use funding to support their annual Writers Week, which showcases teachers’ and students’ songs, slam poetry, narratives and plays. Seventh and eighth grade students at Holy Trinity School (Saint Ann, Mo.) will delve into clay modeling to create dog bowls that represent themselves. Students donate their completed bowls to a local dog shelter. Jana Elementary School (Florissant, Mo.) will purchase rolling carts to make xylophones – the cornerstone of the school’s music program – accessible to all students, regardless of student age or size of instrument. Keeven Elementary (St. Louis, Mo.) in the Hazelwood School District will teach students guitar during music classes, using grant funds to purchase guitars, music stands and electric tuners. Lee-Hamilton Elementary (Ferguson, Mo.) in the Ferguson-Florissant School District will fix or purchase instruments and curriculum materials, giving students the opportunity to learn band instruments at little or no cost and teaching self-discipline, leadership and self-confidence. Fifth and sixth grade students at Mason Elementary (St. Louis, Mo.) present “Shrek, the Musical” with costumes, sets and props they make. The school, where one-third of students are English Language Learners, aims to foster feelings of belonging, acceptance and inclusion with the production. McCluer High School (Florissant, Mo.) students will read and perform “The Color Purple”. The grant will contribute to the much-needed electrical rewiring of the theater so that the production can successfully promote their mission of equity. Normandy High School (St. Louis, Mo.) will put grant funds toward A Season of the Arts: Bridging our Community, a year-long program that aims to join students with the Normandy community to show the power of the arts as a unifying force. It will feature a Culture Fest, a student film festival and “Chicago, the Musical”. As part of expressive art therapy, students at Oakville High School (St. Louis, Mo.) who are experiencing mental health issues will create mixed-media canvases inspired by what it is like to live with their illnesses. Fostering a connection with nature, students at Valley Park High School (Valley Park, Mo.) will create a living piece of landscape art for students, guests, parents and staff to enjoy. The Maritz Arts and Education Fund for Teachers offers schools and teachers unique funding opportunities to support creativity in the classroom. Applications were reviewed by a community review panel at A&E’s Centene Center for the Arts, an arts incubator in the heart of the Grand Center Arts District. For more information about A&E’s grant programs, click here.